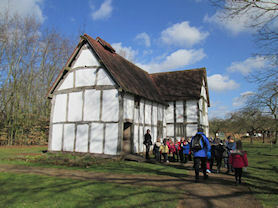 Year 1 visited Avoncroft Museum as part of our topic on Houses and Homes. 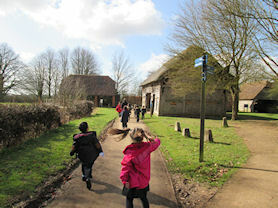 We had a super day, learning about how homes were different in the past. We went on a house-hunt, looking for different houses built by The Three Little Pigs... one made out of straw, one out of sticks and one out of bricks. We found the house which had a straw roof. We thought the wolf wouldn't be able to blow it down because the walls were so strong. Next we found another house. 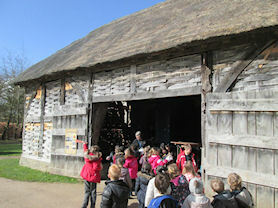 The windows were made using woven sticks. There were lots of items inside this house for us to explore. 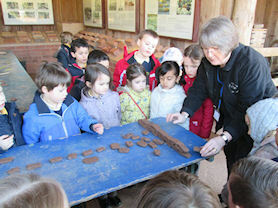 After we found the brick house, we had a go at making our own clay bricks. We made some bricks by hand, then made some using a mould. This made the brick wall stronger when it was built afterwards. The playground there was brilliant! 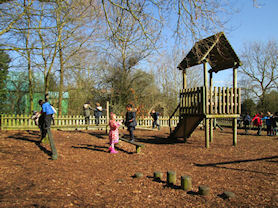 We had fun playing chasing games and climbing trees. 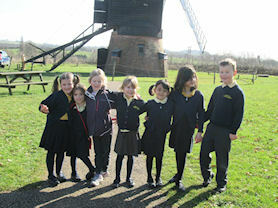 Some of us decided we wanted to go and see the windmill. We got the chance to climb up the steep steps and go inside. The view was spectacular! We set off on our house-hunt. We found the house with the straw roof. There was lots to explore in this house. Making our own clay bricks. Content and Images © 2014-, Maney Hill Primary School.